Albany’s riverfront Dave Clark Trail now has to be the most brightly lit thoroughfare in town, as I think you’ll see if you click on the video and join me for a nighttime ride. The contractor finished installing 80 poles and lights along the 1.2-mile path about two weeks ago, and I thought it was about time that I try them out. Which I did at about 10 o’clock Monday night. Nobody else was on the path at that hour, no walkers or strollers, no other people on bikes, no homeless people looking for a place to camp. No muggers either. Nobody. 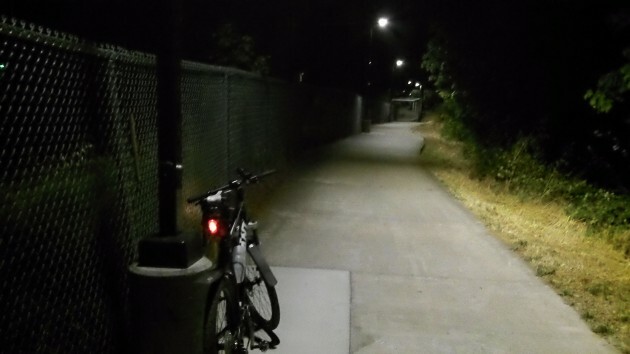 The lights cover the entire length of the off-street portion of the trail, but there are none on the two-block extension along Front Avenue, which pretty well ensured that this video venture would end in the dark. Thank you for the ride along, HH! 1.) Heard concern that the lights will be too bright for Monteith events such as River Rhythms. 2.) There is a sign posted along path just west of Wheelhouse. That sign says “No Pubilc Access” I believe. Gives the impression, to me at least, that the path is private at that point east. I walk that trail on a regular basis usually in the pre-dawn hours. Never have had an issue, but glad to have the lights. If you traverse it enough there are regular things to see; the Rotary Club of Greater Albany pruned, trimmed and spread mulch around the Senior Center, Albany PD walks around Monteith Park on a regular basis, the stage at Monteith needs maintenance – it shows well in the new lights. The lights also high light the tripping hazards of the broken sidewalk, I particularly enjoy dodging the sprinklers that are watering the Willamette River. Still, the lights are a huge improvement and thank you Sandy Roberts for advocating for them, thank you CARA for helping with the financing.